Priced at only $99.99 was $139.99. Ships Free with Amazon Prime! 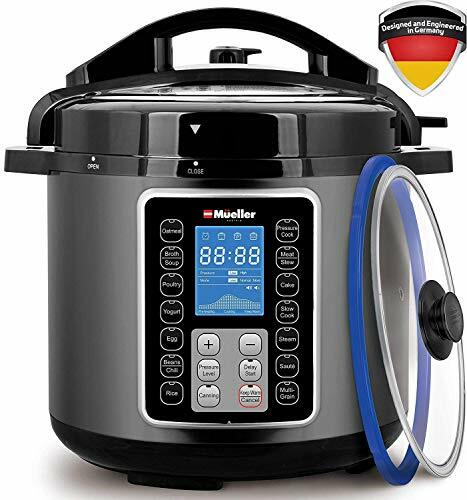 🍲 GERMAN ENGINEERED TO LAST – Unlike other models our cooker is made with high quality rubber seals, strong reliable heat resistant handles and internal electronics made to stand the test of time. 🍲 2 DISHES SIMULTANEOUSLY & ACCESSORIES INCLUDED- We have included a BONUS Stainless Steel Rack which allows you to cook 2 dishes at the same time as well as an extra silicone gasket, ladle and measuring cup saving you time and money! 🍲 NEXT GENERATION ELECTRONIC CONTROLS – Built with the latest generation technology, microprocessors monitor pressure, temperature, keep time and adjust heating intensity and duration to achieve your desired results every time. UL and ULC certified with 8 safety mechanisms in place to provide you with added assurance, designed to eliminate many common errors.